Having bought in to the cloud, many operators are busy transforming their networks to take advantage of the many benefits it offers. But this transformation involves a lot more than merely moving operations to the cloud - it involves business cases and business transformation. The complexities of the transformation are numerous. Many operators may not have the necessary telco and IT cloud expertise in-house. Existing personnel may face lengthy learning curves. But the risk is that the market will not wait. High-performance networks are needed to connect servers within the data center and to the rest of the world. Customers (from individual to enterprise) want to rely on network performance guarantees, and many cloud service providers would like to offer these guarantees but cannot. This risks application performance problems. Meanwhile, cloud transformation must be managed from many angles - most cloud solutions are multivendor and hybrid, risking an unclear infrastructure with overlapping vendor responsibilities, while complex orchestration and maintenance can lead to a disjointed approach by telco and IT teams. With such support, operators can launch new digital services that are right the first time and faster time to revenue, all with reduced risk. 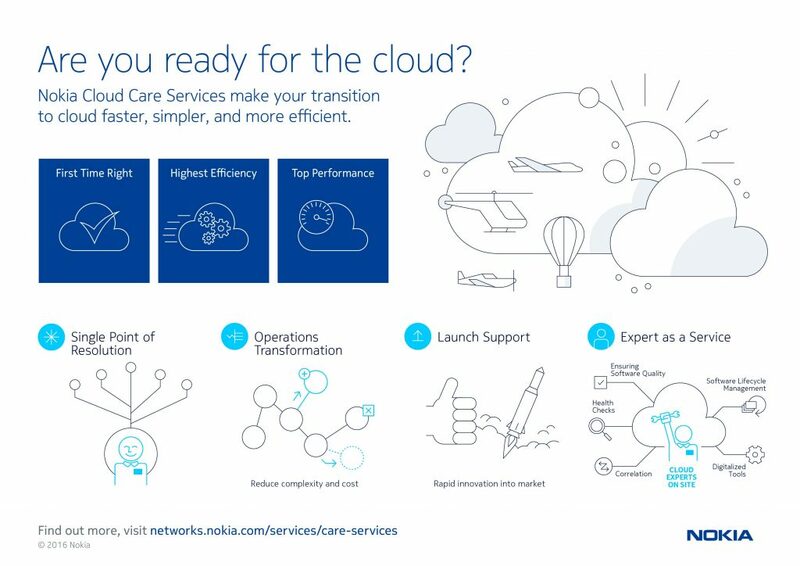 Nokia continues to enrich its cloud care services portfolio with new services launched last month.